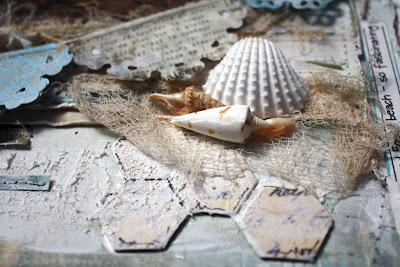 I added heaps of texture paste to mimic beach sand and the muslin represents seaweed . thanks for popping by and for all your wonderful words you leave for me to digest . I am really fond of your backgrounds. They are always so filled with structure and great details. Oh I love the beach so these layouts are divine.. I love how you edge your layouts, and the washed out look is fabulous... and you do the accordion flowers perfectly!! Have a happy Easter! Beautiful lo's Heather! Congrats on your publications....yeah!!!!!!!!!!!!!! Congrats on the pubs!! That is WONDERFUL!!! I loveeeeeeeeee your lo's! Absolutely GORGEOUS!! LOVING the shells on the second page!!! Wow, these lay-outs are both exquisite! The whitewashed colour palette suits the photos really well and I just love all the details that you included. Congratulations on the pub! Wow congrats Heather. These are absolutely amazing. Wow, those LOs are awesome, stunning. I could look at those forever. I just love all the techniques and details on these projects Heather. The white washing is a stunning addition to your layouts! Congrats on the publication! Just so much detail in each and every layout you produce, loving it!! My goodness....Sublime indeed, both of them, so very beautiful, I feel like I am right there! Amazing!!!! More great LOs. I really like the way you layered up the photo in the first one. Congratulations with the publications. Your layouts is beautiful and I really admire your background work...awesome. Both layouts are nothing short of stunning, Heather! WOW! These are gorgeous and so inspiring! Congrats on your publications!! !